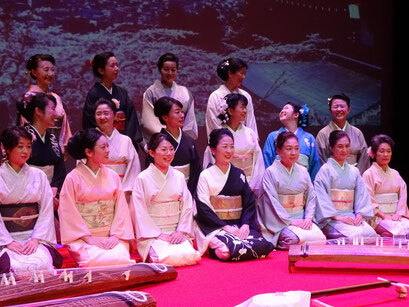 17 members from Mionokai made a tour of koto and shamisen music performance to Slovenia and Croatia in September 2015. It was a great surprise that all concert halls where we played were filled up with audience. All visitors knew kimono, a Japanese traditional garment, very well and welcomed us. When we were in town during our visit, people were very friendly talked to us, we were happy to know that people in Croatia and Slovenia were interested in our culture. It is lovely and sweet memory of a week for us. We would like to thank you to Naohiro Hamada, President of World Event Link, Elena Yamazaki of Japan Croatia Association who had supported our plan for nearly a year in advance, Mr. & Mrs. Ide and their member of staff at Japan Embassy in Croatia, local staff at concert halls in Croatia and Slovenia who supported making a great stage for us, Turkish Airlines with its sponsorship, and all the audience and visitors who came along to tour concerts. Many special thanks from our hearts. Live appearance on Croatian national TV program "Good morning Croatia"